10-man Rovers deservedly earned an FA Cup first-round replay back at the Mem, with Chris Lines coming off the bench at the break to equalise from the spot. The Gas were set up for a tough 83 minutes when Stuart Sinclair was given an early dismissal for a lunging challenge in the middle of the park and they fell behind shortly after when Craig Robson headed home. Having already made a double change after just 22 minutes, Darrell Clarke made his final one before the second half whistle was blown as Lines entered the fray and ended up converting from the spot after Tom Nichols was brought down in the box. The 10 men in blue and white largely controlled the second 45 minutes and even hit the woodwork three times, but were forced to settle for a replay back in Bristol. Ahead of the game, there were just two changes to the side that won so impressively at Blackpool last weekend, with Adam Smith replacing Jack Bonham between the sticks who has been made unavailable to represent Rovers in this competition by his parent club Brentford. Sinclair also came back in the side, replacing Ed Upson in midfield. Prior to kick-off, a minutes silence was impeccably observed by all inside The Hive, as we paid tribute to those who have lost their lives fighting for their country, 100 years to the day on from the Armistice of World War One. After a scrappy opening five minutes, the first half chance of the afternoon fell to the hosts from the game’s first corner as Craig Robson found some space at the back post and had more or less a free header but couldn’t connect with the ball. 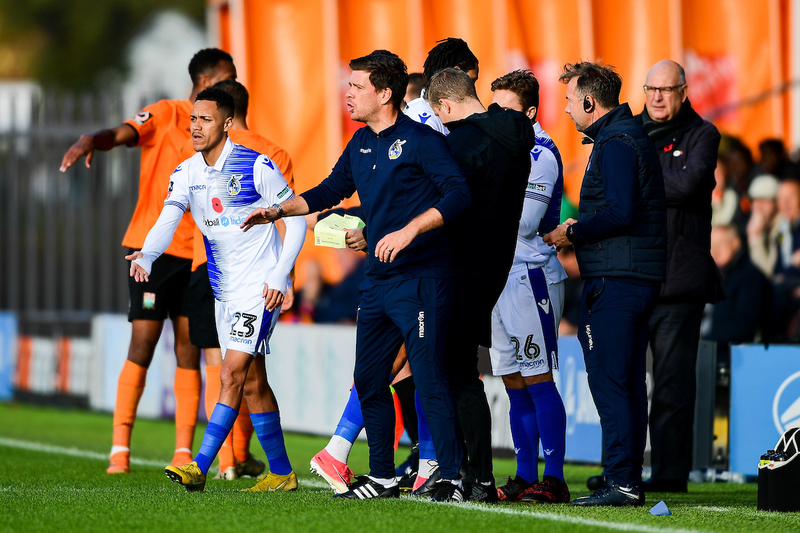 However not long after that, the game’s first moment of significance occurred and it wasn’t good news for Rovers, who were reduced to 10 men after just seven minutes when Sinclair was given his marching orders for an alleged dangerous lunge on Barnet’s Wesley Fonguck. 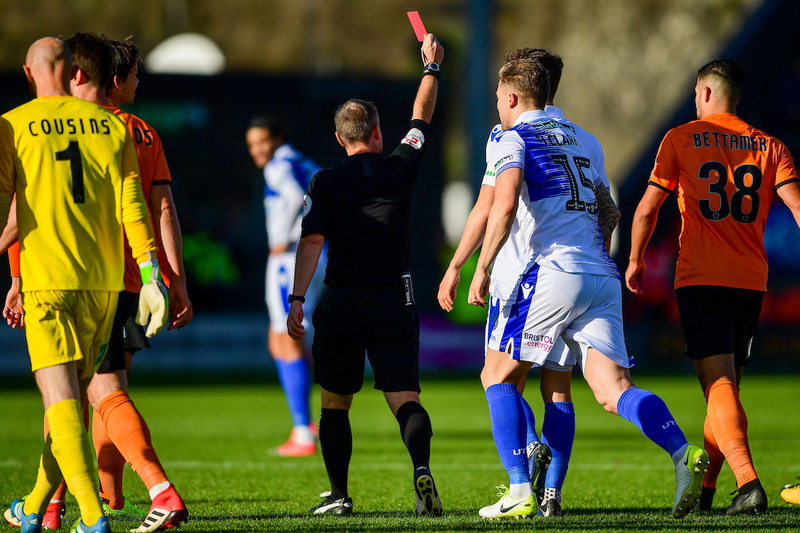 Stefan Payne was also booked for his protests against the referee’s decision. Smith was making his first appearance since the Carabao Cup defeat to Queen Park Rangers in August and was required to make his first real save as he batted away Jack Taylor’s powerful drive from the right. The 25-year old stopper made an even better save moments later, as Elliot Johnson teased in an awkward free-kick towards the back post leaving Smith unable to commit until the ball had passed through the bodies but once it did he showed excellent reactions to tip the bouncing delivery over the bar. Despite Rovers’ resilience to this point, The Bees made their man advantage tell and found a way through with a third of the first half played, when Robson this time connected with his header and found the far corner. The goal prompted D.Clarke into a bold early switch up, with Payne and Daniel Leadbitter unfortunate victims of Sinclair’s dismissal as they were replaced by Sam Matthews and Kyle Bennett just 22 minutes in. Barnet’s keeper had little to do in the first half of the opening 45 however Liam Sercombe gave him a gentle reminder of his duties with a low strike from distance that forced Mark Cousins down to his left. Following the change of personnel and shape, Rovers were enjoying more of the ball but Barnet had not lost their threat, Smith once more with a save as he denied Fonguck’s decent effort after a decent run into the box. Rovers’ discontent with the officiating was heightened when Tom Nichols went down in the box under a challenge and was booked for alleged simulation, which insensed D.Clarke who was subsequently booked by the referee himself. Matthews had taken up a position down the right following his introduction and showed a flash of what he can do by gliding past three orange shirts and into the box before almost picking out fellow substitute Bennett in the centre but Barnet’s defence did enough to clear. Rovers came out for the second half with no more substitutes remaining as Chris Lines came on in place of Michael Kelly. The Gas had a good chance early on after the interval when Nichols did well to flick the ball on and behind the Barnet defence for the mobile Bennett who forced a strong stop from Cousins. As the visitors pushed forward in search of an equaliser and with their numerical disadvantage they naturally became stretched at the back and Tony Craig was almost left red-faced when he mishit his back pass and Immanuelson Duku went one-on-one with Smith; thankfully for Craig his keeper got him out of jail with a well-timed challenge. On 64 minutes Rovers got the moment they needed as O.Clarke did superbly to drive down the right flank and fizz a ball at the near post that was met sharply by Nichols and led to the striker being brought down – this time the referee confidently pointed to the spot. Lines stepped up from 12-yards to calmly dispatch the penalty into the bottom left corner before celebrating in front of the Rovers fans behind the goal. D.Clarke’s men had their tails up following their leveller and created panic in the Barnet defence when Lines met a half-volley ferociously on the edge of the box before almost dribbling the follow-up past the hosts and onto goal, but he was stifled; Bennett also had a snapshot but he too was blocked. 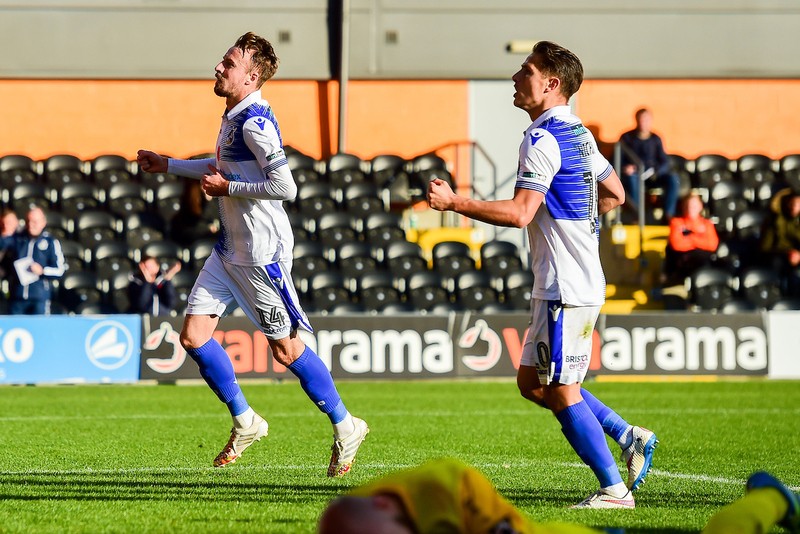 Despite Rovers’ continued ascendency since their goal, Barnet looked to break when they could and came close when Taylor’s left-footed strike from 25-yards bounced off the top of the crossbar. With 10 minutes left the other bar at The Hive received a rattling… twice. First O.Clarke who had another great game in midfield came steaming onto a loose ball on the edge and saw his powerful drive take a slight clip before smashing the woodwork and ballooning behind for a corner. The resulting set-piece found it’s way eventually to Sercombe in a similar position who shot in a similar fashion which produced a similar outcome – a vibrating crossbar. Just after the fourth official raised his board displaying four minutes of additional time, Rovers again went close to snatching victory when Lines struck a half-volley to absolute perfection on the edge of the box, it arrowed towards goal but crashed against the post and away from danger as it became clear this tie would have to be settled at BS7. Rovers XI: Adam Smith (GK), Daniel Leadbitter (Kyle Bennett, 22′), James Clarke, Tom Lockyer (c), Tony Craig, Michael Kelly (Chris Lines, 45′), Stuart Sinclair, Ollie Clarke, Liam Sercombe, Stefan Payne (Sam Matthews, 22′), Tom Nichols. Unused subs: Alexis Andre-Jr (GK), Rollin Menayese, Joe Partington, Gavin Reilly. 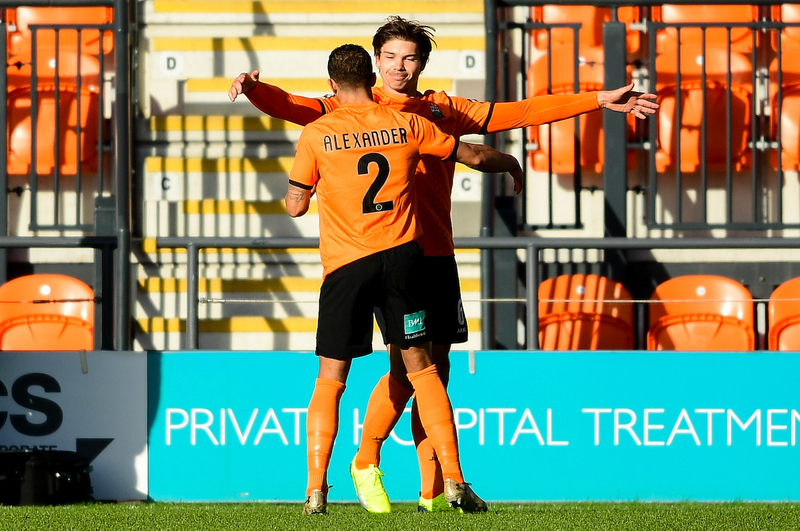 Barnet XI: Mark Cousins (GK), Cheye Alexander, Elliot Johnson, Callum Reynolds, Craig Robson, Charlee Adams, Jack Taylor, Wesley Fonguck (Dan Sparkes, 68′), Dan Sweeney, Manny Duku (Byron Harrison, 84′), Mohamed Bettamer (Josh Walker, 77′). Unused subs: Rihards Matrevics (GK), Dave Tarpey, Shaquile Coulthirst, David Tutonda.